Finally it is the time to end the suspense and to reveal what I been holding since last few days. Yes! The One is here. The one you waited to hear about from me, the one, over which I was dying to get my hands on. And finally thanks to Tom and Paul, it is here. King of kings, Nokia N9. 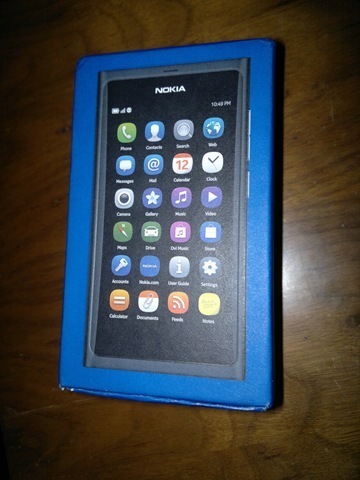 Its been 323 days back from here, when I requested the Santa to bring a Nokia N900 for me and while I thought he missed my plea back then in flood of pleas from others, I can hear that he didn’t missed me, but thought to greet me with something even bigger than that. Something that might have removed all the shortcomings of Nokia N900 I once cribbed about and bring this much more than for counting even my fingers could fell short. I know you wanna hear all about it, I know you wanna see all what you haven’t seen.. in next coming days, I will try that I wont disappoint you all. Now let me go back to the dreamland again. It is because of the range of apps and continuous upgrades made me think that iPhone is the smartest. But I haven’t explored the other phones. What is it exactly about N9 that you liked?